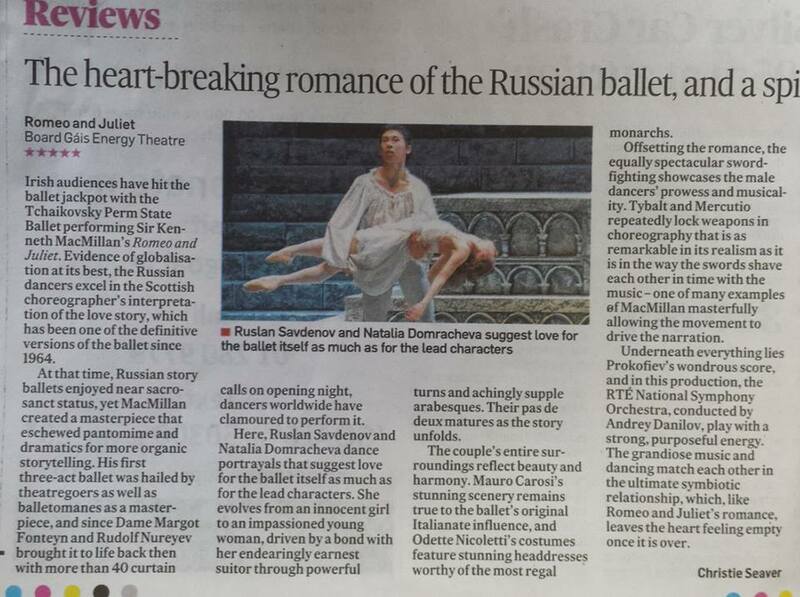 The Tchaikovsky Perm State Ballet proudly presented Prokofiev’s ROMEO AND JULIET – accompanied by The RTE National Symphony Orchestra with choreography by Kenneth MacMillan. The Perm State Ballet enjoyed standing ovations every night for their successful production. “This was the biggest production we have ever staged to date in Ireland,” enthuses the organiser Simon Walton of Ballet and Opera Ireland, “it is the same version as presented by The Royal Ballet (originally starring Rudolf Nureyev and Margot Fonteyn) and The American Ballet Theatre’. Romeo and Juliet meet at a ball and fall passionately in love. But their families are sworn enemies, divided by a bitter feud. A tragic tale of star-crossed lovers: Kenneth MacMillan’s poignant Ballet is a twentieth century classic. Shakespeare’s greatest tragedy has never been interpreted better or more beautifully. Irish audiences have hit the jackpot with the Tchaikovsky Perm Stat Ballet performing Sir Kenneth Mac Millen’s Romeo and Juliet….The couple’s entire surrounding reflects beauty and harmony…stunning scenery remains true to the ballet’s original Italianate influence…The grandiose music and dancing match eachother in the ultimate symbiotic relationship, which like Romeo and Juliet leaves the heart feeling empty once it’s over.